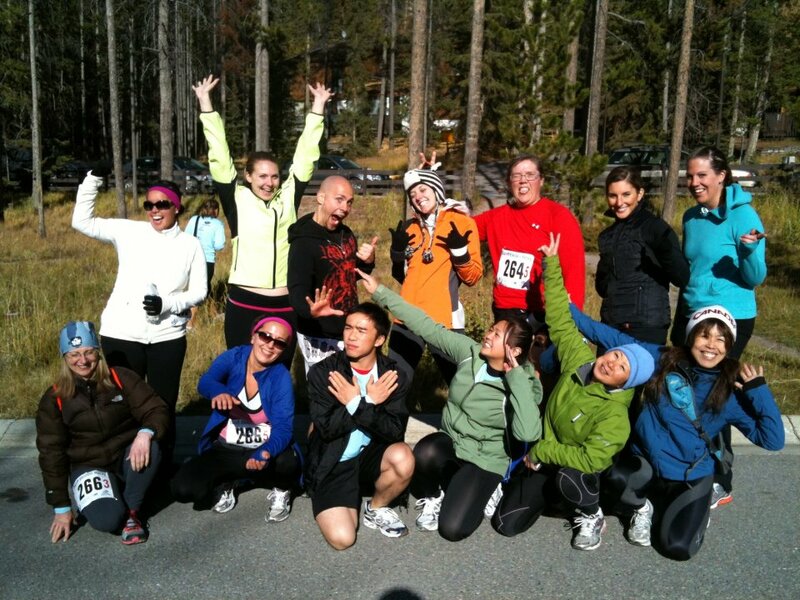 this weekend, a whole bunch of us (~15 ppl) hauled our butts out to Banff and participated in the Banff Ekiden Relay! 5 people to a team, and a total of 42km. I ran leg 2, the longest of the 5 legs, at 13.8km… I completed it in approximately 1:32:30…. which is almost 30secs/km faster than my runs have been! Maybe it was the fact that the entire first half was downhill 😉 having said that, the 2nd half was just running back up the first half! aside from my right foot which has been bothering me since last saturday, we all had a BLAST! Everyone did really well, save for a couple minor injuries, and i cannot wait to do it again next year. Way to go Angry Squirrels, Bear Bait, and Trail Mix!!!! due to the injury/soreness on my right foot, i am going to take it really easy this week… i might not actually run until saturday. that makes this week “cross training week”!